In the midst of an uneasy truce a travelling historian, the leader of an army and a trio of martial arts masters are invited to a seemingly abandoned castle. 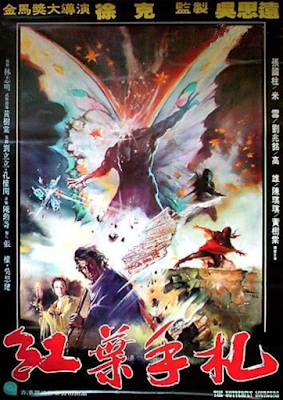 They discover the few remaining inhabitants hiding in the subterranean caverns beneath the fortress, afraid of a curse that would see people killed by swarms of poisonous butterflies. When people start to die it seems the curse is real; however the appearance of an armoured warrior suggests a more cunning plot is behind the murders. I'll be honest, this film failed to grab me in its first half hour. I kept half an eye on the rest of the movie, but lax concentration on a subtitled film means your hardly watching at all. An hour in and despite it looking pretty I'd kind of written it off. The then final 30 minutes played out and I was mesmerised. I had no idea who was who or what was going on but the images captured my attention so much that after the movie finished I started it all over again. Second time round, with my attention at its fullest, the film revealed itself to be a wonder. The version I was watching had a butchered aspect ratio, fuzzy VHS edges and drained colour. Even so the movie is gorgeous. Lush countryside, a wonderfully disheveled castle, spooky caverns and flashes of colour fill the eye. My god, a remastered print of this would be a treat. It's heavy on plot and keeping an eye on who is who is pretty important, especially early on, but its plotting isn't quite as complex as perhaps the less than spot-on translation would suggest. What is particularly exciting is how it takes many of the tropes of your average Shaw Bros kung-fu movie (including wire-fu and magic powers) and mixes them with a lurid murder mystery vibe. It is, essentially, a kung-fu Giallo. Let that sink in for a second: a kung-fu Giallo! So what was in that final half hour that convinced me to watch this movie twice in a row? Eastern maestro Tsui Hark has always innovated and this movie (his debut no less) is no exception. Dropping the standard wide shot fight scenes he uses many angles, hand-held and machine-gun editing to add a frenetic element to the action. This, alongside choreography that eschews the occasionally stagey pace of some traditional martial arts and presents more brutal, grounded fisticuffs (that is when they are not flying or throwing fireballs at each other). Each fight is charged with stakes and once I had each person's name and purpose down I was genuinely involved in each of their struggles. In addition the armoured warrior is instantly iconic. A one man war machine that fucks up everyone in his path. His studded leather armour adds another shade to the films palette meaning the visual artistry evident in the rest of the movie carries through into the action. The Butterfly Murders is lush, gory and thrilling: an absolute martial arts all-timer that should please fans of orchestrated melee movies and opulent European whodunnits equally.